NEW BEGINNINGS-IT TAKES COURAGE TO CHANGE ©: AND VASHSTI SAID NO ! "The Lord says, I will guide you along the best pathway for your life. I will advise you and watch over you." You cannot fix your fears until you face the truths! By Facing the truths you are facing your fears! Do you know the story of Queen Vashti? Her story is in the Book of Ester (1; 2:1; 4:17). Her name means "beautiful woman." She must have been one of the most loveliest women in the land for her husband, King Ahasuerus thought so much of her physical beauty that he wanted to 'display' her during a drinking party for his friends. For she "was fair to look upon." 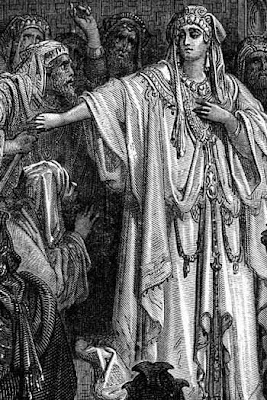 There is not much history about her life-she was a Persian princess, the daughter of Alyattes, King of Lydia. It would be nice to know what became of her life after she gave up her position as Queen in order to stand and keep her integrity and her goldly wisdom. Since we do not know her ending-we know the middle part of her life. Let us learn about the condition of her heart. 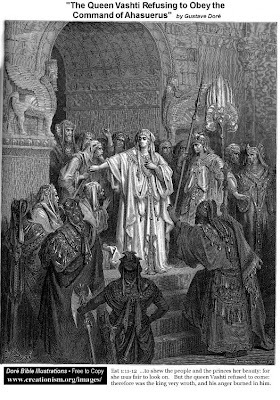 Even though the story of Vashti only covers a few pages in the Book of Ester, in the setting of grandeur we have the elements of God's design in her life and the life of Ester. The main point of the story is that Queen Vashti was 'divorced' by her husband for her refusal to come out of her room and 'dance' for his drunken friends at a banquet. She flat out refused-- AND VASHTI SAID NO! She stood her ground and faced her fears in order that the truth would be revealed and God's divine plan would move forward. She placed a higher value on her integrity and on wisdom than she placed on her fears of what might happen to her. For it says, that her husband, the King, "who reigned from India even unto Ethiopia, and over an hundred and seven and twenty provinces." By this we can conclude that he was very wealthy and a very powerful King. Rather than cater and be a slave to the vanity of lusting drunks she courageously sacrificed a kingdom. She accepted disgrace and dismissal instead of trying to please people's wicked desires for her life. During these times the living conditions for women were not good at all, (humm, sounds like now). Women were treated pretty much as slaves in many homes with no rights, no voice, no individuality-fully ruled by men and their laws. Ahh , but what thoughts that man thinks on-God always thinks higher. And it seems to me, that Queen Vashti was not trying to be a better slave! Let me ask you this, what fears are you slave to? Who are you trying to please at the expense of your dignity and godly wisdom? She was not concerned with what she was giving up, the people, the material things and the visual status-she was not concerned with being a better slave. She should have been killed-strung up for ridicule--she knew these things, but still she stood her ground and spoke her truth knowing that the consequences could lead to death. I'm sure she was weighing the options-she was probably thinking; would it be harder to say NO and deal with the fallout-OR- would it be harder to keep quiet and just go do what he asked her to do? Obviously, for her it was much harder to bow down to the drunken lust filled requests "to shake her groove thang" for these men than to stand on solid ground and say NO! What/Who do you need to say NO to? What are you a slave to and are you trying to be a better slave? By this I am asking you to think about your life, which situations are you trying to keep calm-make no waves in order to please others that are wrong? Instead of speaking the truth and standing your ground with integrity to correct what is wrong in your life-are you a slave to your fears? What ways of thinking and acting do you need to face with truth in order to correct? Are you trying to gather more straw to make the bricks for Pharaoh instead of looking toward the freedom that has been delivered as asked for? Are you trying to be a better slave-or-a better servant for God? Are you worrying about what you lack, what you have lost, what you have given away? What value are you placing on your life? Where in your life have you placed the highest value? On things and status which will cause others to applaud and cheer you on? Or, are you working to hear the Lord speak, "Well done My good and faithful servant." ? What values do you see revealed in your heart? What will you settle for or sell out too? Is your value so low that the reality it reveals scares you? Face your fears-Face your truths, and only then can things be fixed. Look at the condition of your heart-what lives in your heart? The end result of wisdom is honor, and the purchase of virtue will establish an entire house with a value "far above rubies"- priceless! 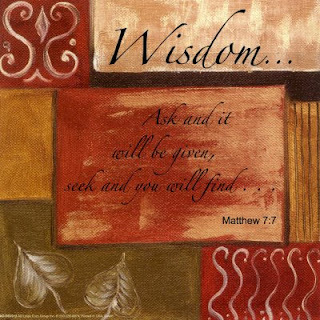 Know that the Lord Jesus, God's Son-His value too is determined in the wise and virtuous heart: ask yourself this = What price am I willing to pay, what priority am I willing to give and what end result and true condition of life do I expect to live-really? If you are trying to be a better slave then you have placed a very low value on your life. If you are desiring to walk in your freedom, to walk in your faith-on the promises of God--then you have accepted the Value that God divinely placed on your life through the Life, Death, and Resurrection of Jesus. Let us confess from our hearts what we know to be the truths that feed our spirits. Father God, I come to You in the Name of Jesus to confess that I am honored that you have included me in with the women and men I see who have paid the price for the real thing-the value of true spirituality. I see their wealth in You and I admire their courage. I desire above all things the reality--the truth of Your Son's Lordship in my life-Everyday, in every area of my life. Father, I am persuaded and determined to stay the course You have set for me this day--my priorities are divinely ordered and so is my reality. All that I am and All that I posses-my life, I bring to the One Who is Priceless. in the Name of Jesus I thank You for I know my requests have been heard by You. Yea Amen. Know that God loves you and only wants the best for you life. Continue to serve others using the gifts and anointing that God has placed within you. Glory Be Unto God The Father, God the Son and God the Holy Spirit. Keep standing on The Rock, all other ground is sinking sand! Lord, my God, I confess from my mouth that I will take every opportunity given to trust You for All that I need. I know that this is no time to allow circumstances to send me into a tail spin and crash. I will continue to be strong and walk in my faith not fears. For Lord I know that You see my needs and the Price has been paid on Calvary for All Answered Prayer. I Will push through the troubles and fears that roam the land seeking to devour as I Will not look at them with my natural eyes. I will rise up in Your Spirit to receive what You have already supplied for my life-Glory be to You God, in the Name of Jesus I thank you Father, Yea Amen. Great post. The choice is between freedom and slavery. thank you and Glory Be To God for His directions. yes, that is the point--are you going to be a better slave or a free servant? I wrote/preached a sermon with the same title. I plan to post it in the coming month.